St. Osyth lies about five miles to the west of Clacton-on-Sea and is approached from either Clacton or Colchester along the B1027. To the west of the village centre is Point Clear and Point Clear Bay where Stone Point in the Bay is only about half a mile across Brightlingsea Creek from the historic Cinque Ports town of Brightlingsea. The village was known as Chich in the 7th Century and is still affectionately known as Toosie. St. Osyth is a parish within the Tendring District Council administrative area and in the County of Essex and has an estimated permanent population of 4,600 which increases significantly during the holiday season due to the popular holiday parks located at St Osyth’s Beach and Point Clear Bay. The centre of the village is dominated by the medieval remains of the Priory on its 383 acres of land, building of which began in the year 1118. It was established for the Augustine Canons and became one of the great Augustine Abbeys of Europe. The Priory continues to be used as a home by its owners and we hope, though closed at the present time, it will soon be open once again to members of the public, following significant repair and refurbishment of the main buildings and other buildings within the grounds. The name St. Osyth is attributed to the daughter of Redwald, King of East Anglia, who in 653 AD, was beheaded by Danish invaders, because she would not worship their idols, and the Priory was built in her honour. The centre of the village was designated as a conservation area in 1969 and this designation extended in 1982 and 1988. The Parish has 112 buildings listed as of historic or special architectural interest, including the Priory and the Church of St. Peter and Paul which are both Grade 1 listed buildings. There are other buildings of historical interest including The (Witches) Cage which dates back to the 16th Century. The Parish of St Osyth lies about five miles to the west of Clacton-on-Sea and is approached from either Clacton or Colchester along the B1027. 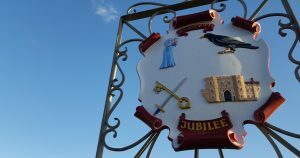 To the west of the village centre is Point Clear and Point Clear Bay where Stone Point in the Bay is only about half a mile across Brightlingsea Creek from the historic Cinque Ports town of Brightlingsea. St Osyth is a parish within the Tendring District Council administrative area and in the County of Essex. The centre of the village is dominated by the medieval remains of the Priory on its 383 acres of land, building of which began in the year 1118. It was established for the Augustine Canons and became one of the great Augustine Abbeys of Europe. The Priory continues to be used as a residence by its owners and we hope, though closed at the present time, it will soon be open once again to members of the public, following a recent change of ownership and major repairs and refurbishments to the main structure and other buildings on the estate. St Osyth is an area which has become a favourite place for holidaymakers, the majority of whom use static caravan and chalet facilities, either as owners or visitors in such numbers as to raise the population in the Summer Season to over 20,000. To the west of the village centre is Mill Street which leads to our small harbour, used by seafarers for mooring and boat repairs.To the western end of St Osyth Beach is an area set aside where naturism may be practiced. The Area of St Osyth and Point Clear is 3,221 Hectares (which is 7,959.41 acres or 12.44 square miles) with a population density of 1.28 persons per hectare. The Tendring area is 33,758 hectares with a population density of 4.10 persons per hectare. The National population density is 3.77 persons per hectare. so clearly we are a small community spread sparsely over our ward. On the coast are three Martello towers in the area built between 1809 and 1812. 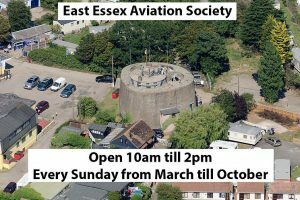 The St Osyth Tower is now an aviation museum. 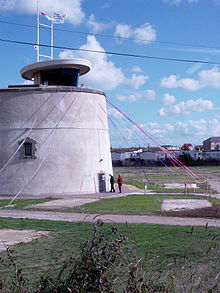 The recently refurbished Jaywick Martello Tower is accessible from St Osyth Beach and is open to the public at weekends from March to September. A foot passenger ferry operates between Point Clear, Brightlingsea and Mersea Island with scheduled services in the Summer and a dial up service in the winter. See the Transport section for more information.